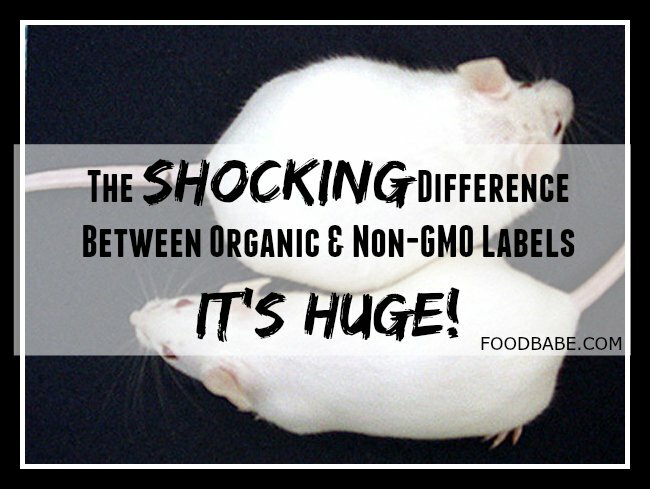 The Shocking Difference Between Organic & Non-GMO Labels – It’s Huge! One of the things I love to do every year is visit The Natural Products Expo, I go to both shows every year (west coast and east coast) to see the types of natural products food companies are creating and meet the founders behind them. Every year I see more and more Non-GMO products being created which is a great sign of the times, but there’s something really tricky and important you need to know about these products. 1. Certified organic foods are also non-GMO. USDA organic regulations prohibit any genetically modified (GMO) ingredients in a certified organic product. I avoid GMOs at all costs, and going organic is one of the easiest ways to do it. NOTE: The USDA Organic label certifies that 95%-100% of the ingredients are organic, so there is a slight chance that (up to 5%) of non-organic ingredients are in the product – however they are not supposed to be GMO. There are still some tricky loopholes, so that’s why you need to look for “100% certified organic” or a “Non-GMO Project” verified label to ensure it’s GMO-free. 2. Organic crops cannot be grown with synthetic pesticides, and contain much lower pesticide residues overall. Organic regulations prohibit certain toxic pesticides from being used on crops, but there are no special restrictions for non-GMO crops. So, non-GMO crops can be grown the same as other conventional crops and can still be laden with toxic pesticide residues, including organophosphates that are linked to lymphoma and leukemia. A bag of non-GMO potato chips can contain residues from up to 35 different pesticides used on conventional potatoes, several of which are known carcinogens, suspected hormone disruptors, neurotoxins, or reproductive toxins. Also non-GMO produce (like strawberries and celery) are on the EWG’s Dirty Dozen Guide as the most contaminated with pesticides. While natural pesticides are allowed on organic crops, it’s been shown that organic produce has very low levels of pesticide residuecompared with conventional crops, and by eating organic you can significantly decrease your exposure to pesticide residues (source). 3. The most widely-used herbicide on the planet – Glyphosate (Roundup) – is prohibited on organic crops. Non-GMO crops such as wheat can be pre-harvested with glyphosate. This herbicide is a toxin that can accumulate in your body the more you are exposed to it. It has been linked to kidney disease, breast cancer, and some birth defects. According to Dr. Stephanie Seneff, a senior research scientist at MIT, glyphosate is largely responsible for the escalating incidence of autoimmune and other neurological disorders that we are experiencing. There are many non-GMO products on the market that contain wheat and seem healthy – but they could be laced with glyphosate. For instance, whole-wheat breads and non-GMO cereals that aren’t organic(like Grape Nuts) may contain glyphosate residues. 4. Organic ingredients aren’t processed with toxic hexane. Most conventional oils (canola, soybean, corn) are extracted with the neurotoxin hexane, and some residue has been shown to remain in these oils. Hexane is also used in the processing of many soy ingredients like soy protein and textured vegetable protein, and testing done by The Cornucopia Institute has found residues in some of these ingredients. Almost all research focuses on the industrial use and inhalation of hexane: “No epidemiology or case report studies examining health effects in humans or chronic laboratory studies evaluating potential health effects in animals following oral exposure to n-hexane are available”. Why isn’t anyone studying how “safe” it is to have this neurotoxin in our food? Industrial exposure has been linked to brain tumors and nerve damage. The FDA does not set a maximum residue level for hexane, and no one knows for sure how much residue is being consumed by the American public. There’s nothing prohibiting these ingredients in non-GMO products, but hexane-processed ingredients are banned from products with the USDA Organic seal. 5. Organic crops are prohibited from being fertilized with sewage sludge. 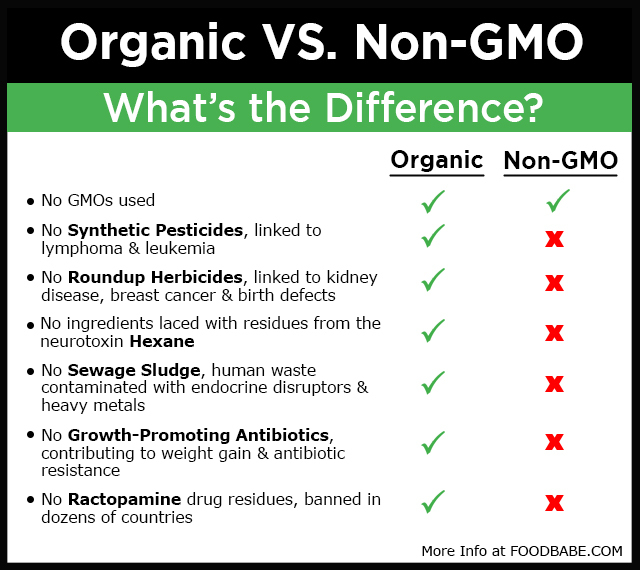 Conventional non-GMO crops can be treated with “biosolids”, which is literally the treated waste that’s flushed down the toilet, and waste from hospitals and industry. This waste can be contaminated with such things as heavy metals, endocrine disruptors, pathogens, pharmaceuticals, pesticides, and dioxins – it’s basically a toxic chemical soup! It’s been shown that some of these contaminants are absorbed into (or remain as residue on) the crops that we eat. These residues have proven deadly to cattle that have grazed on crops fertilized with biosolids, and it certainly isn’t something we should be eating. 6. Organic meat isn’t produced with growth-promoting drugs, like ractopamine.Packaged non-GMO foods may contain meat that has been raised on growth-promoting steroids and drugs. Residues of some of these drugs have been found in meat and it’s been shown that eating products with traces of ractopamine can lead to an unacceptable level of risk of diseases of the cardiovascular system. 7. Organic animals aren’t fattened up with growth-promoting antibiotics. The overuse of growth-promoting antibiotics is creating superbugs that could threaten the entire human population. Antibiotics have been used for years, not just to fight infection, but to fatten up farm animals. This use is polluting our environment, water and food supply. Studies show that antibiotics have the same consequences for us, and can fatten us up too. This is because antibiotics kill off healthy bacteria in the gut – beneficial bugs called probiotics that influence how we absorb nutrients, burn off calories, and stay lean. Scientists have found that lean people have more of the good, anti-obesity bacteria in their guts, compared to people who are overweight. Growth-promoting antibiotics are only being used to increase industry profits and the best way to stop these practices is to refuse to buy products made with them. 8. The non-GMO label claim is unregulated. Essentially anyone can say that their product is non-GMO, because the FDA has not set any standards to regulate the use of this claim on a label. This is not to be confused with the Non-GMO Project label, as they have a process for verifying whether products are non-GMO, and I feel that their label can be trusted (just as Whole Foods will only label products as non-GMO if they carry the Non-GMO Project verification label or are certified organic). However, some food manufacturers have been caught red-handed with unverified claims on their packages that say they are “non-GMO” when they really aren’t. As no independent 3rd party testing is required to verify their claims, there is some corruption going on. For instance, when Consumer Reports tested Xochitl tortilla chips with a non-GMO claim on the bag, they found GMO corn in them. Since most of these non-verified products have not been 3rd party tested and there are no government regulations, it’s not a reliable label claim. 9. Organic foods prohibit many of the chemicals known as “obesogens” that trigger our bodies to store fat. Antibiotics, growth hormones, pesticides, and synthetic preservatives are just a few of the chemicals that researchers have defined as obesogens. The theory that obesogens in our food and environment could be making us fat has been gathering steam ever since researcher Paula Baillie-Hamilton published an article in the Journal of Alternative and Complementary Medicine in 2002, presenting strong evidence that chemical exposure caused weight gain in experimental animals. As reported in the New York Times piece, “Warnings From A Flabby Mouse”, exposure to endocrine disrupting chemicals can cause weight gain. This is important because many of the synthetic pesticides that can be found on non-GMO conventional crops are endocrine disruptors. Also – the sewage sludge fertilizing some of these crops has been shown to contain endocrine disruptors. Minimizing your exposure to obesogens by choosing an organic diet may be the boost you need to lose weight and keep it off. 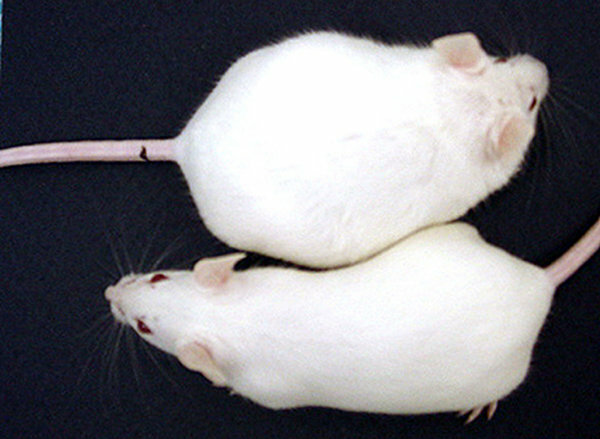 The only difference between these mice: The one at the top was exposed at birth to a tiny amount of an endocrine-disrupting chemical – these chemicals can be found in synthetic pesticides sprayed on non-GMO and conventional crops. 10. By choosing organic food you’ll automatically avoid most of the “Sickening 15” ingredients that I talk about in my new book, The Food Babe Way. Chemicals like synthetic preservatives, synthetic pesticides, growth hormones and antibiotics are not used in organic food. These are the chemicals that can make you tired, wreak havoc on your skin, make you feel fat and miserable, even though you’ve been dieting and exercising like crazy. Even worse – they may put you at risk for scary, life-shortening diseases like cancer. I’m not saying that all organic products are perfect. Some of them contain suspect chemicals too. Hidden MSG – Although monosodium glutamate is prohibited in organic food, they can use other forms of free glutamic acid – such as Yeast Extract, Hydrolyzed Soy Protein, Autolyzed Yeast Extract, Textured Protein. These chemicals are excitotoxins and can greatly influence how much you eat. For a full list of these hidden MSG additives, check out my new book – The Food Babe Way. Posted on 26 Mar 2019 by NationalAddictionNewsPosted in addiction, Food Addiction, Food Dangers, GMO's, organicTagged eating healthy, food babe, Food Dangers, gmo, non-gmo, organic. Previous Previous post: THE MOST TOXIC MEAT IN ALL OF HISTORY! ARE YOU EATING THIS?